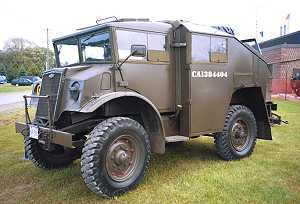 A mostly-restored 1944 Chev Field Artillery Tractor. Belonging to the regimental association of the 7th Toronto Field Regiment (a militia artillery unit), this 'Quad' is in superb condition, albeit still needing finishing touches. 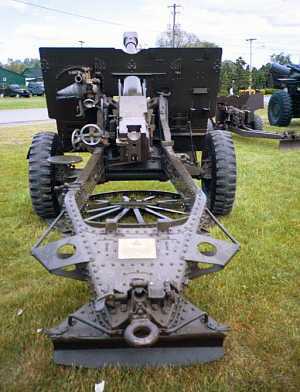 The CMP FAT, together with its limber and 25 pdr gun/howitzer, was the cornerstone of the divisional Field Regiments, of which there was one per brigade. These regiments prided themselves on both speed and accuracy in support of their infantry formations. For a superb and exhaustive summary of the role of field artillery in the Canadian Army Overseas, please see George Blackburn's acclaimed trilogy, "The Guns of Normandy", "the Guns of Victory" and "Where the Hell Are the Guns?". The FAT combination, from right to left, Quad, Limber, Gun. The tractor is built upon a 101-inch wheelbase chassis, and includes a PTO winch which could be used to haul from front or rear. The limber contained a base load of 25 pdr ammunition (32 rounds) which would be used in 'crash action' drills rather than in normal, emplaced fire. 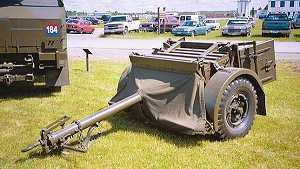 The Quad towed the limber and the gun was in turn hooked to a pintle on the back of the limber. The limber opened up. Each aluminum tray held two rounds. 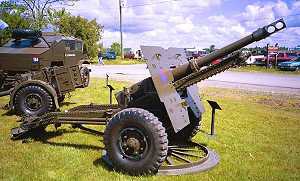 The 25 pdr was made more flexible by having two-piece ammunition, i.e. 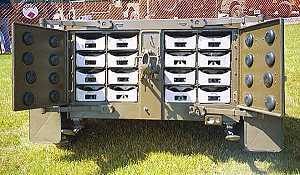 a separate case with adjustable powder charges, and separate projectile. The gun itself. MARINE INDUSTRIES in Sorel, Quebec manufactured 25 pdrs throughout the war (any others, email me?). Accepted rate of fire was 5 rounds per minute, but average thoughout the firestorm in Normandy was 12 rpm, with one documented case in 4th Field of an incredible 17 rounds fired by one gun in one minute! View from the operational end. Note the round plate underneath the wheels. Normally carried slung under the trails, this device obviated the necessity to dig in separate trails, and permitted the gun the hitherto unknown luxury of being able to traverse 360 degrees in seconds. When it was time to change positionss, the gun was pulled forward off the disk, which was then cranked up underneath the trail. Crash action drills showed that the eight guns of a battery could be brought into use from column of route in as little as five minutes. In normal emplacement, each gun crew would dig a gun pit 18 feet in diameter and 18-36 inches deep. The Quad would then pull the gun into the pit (and winch it out afterwards). Another pit would be dug by each gun for ammunition storage. The survey method employed by the arty people in Europe ensured that Forward Observation Officers (FOOs) accompanying the brigade's infantry units could call for any level of accurate fire from a single gun to every available gun in theatre, all within a few minutes. The volume of fire of which every 25 pdr regiment alone (24 guns) was capable resulted in several documented cases where captured German officers had indicated an interest in seeing our "automatic" field guns. 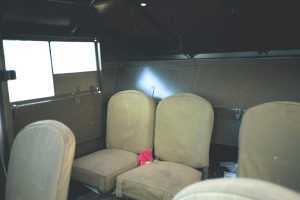 The rear troop compartment of the Field Artillery Tractor, looking from the left front (gun commander's) seat. 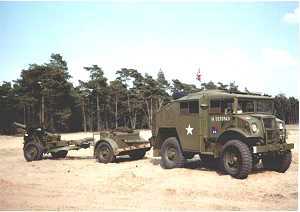 The Quad provided transport for a gun and its crew as an integral unit. There were eight guns per battery, three batteries per regiment. Troop, battery and regimental personnel rode in White M3A1 Scout Cars and Heavy Utility Personnel CMPs. FOOs (usually one per infantry regiment) were assigned Universal Carriers with a driver and two signalmen. 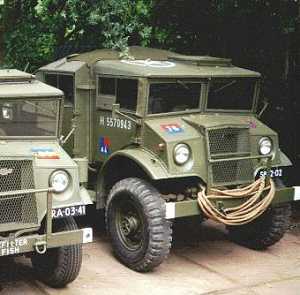 Dirk Leegwater from the Netherlands submits the following two photographs of a Chev FAT (including limber and gun) in his collection. Truly magnificent! Another view of Dirk's FAT. Well done!